Rep. Tulsi Gabbard's (D., Hawaii) campaign criticized "media giants ruled by corporate interests" in a fundraising email sent out on Saturday. The email also suggests journalism is being used against her campaign in a manner akin to 1950s-era McCarthyism. "Today, our freedoms and democracy are being threatened by media giants ruled by corporate interests who are in the pocket of the establishment war machine. When journalism is deployed as a weapon against those who call for peace, it threatens our democracy as it seeks to silence debate and dissent, creates an atmosphere of fear and paranoia, and stokes the rhetoric that could lead to nuclear war," the email states. "This danger is not new – we saw it take hold of our nation during the last Cold War, as McCarthyite hysteria," the email continues. The email argues that the media is trying to stop her campaign through "Russia-baiting propaganda." "Russia-baiting propaganda is being deployed against our campaign along with anyone else, on the left or the right, who speaks out against regime change war or the new Cold War. The corporate media is doing everything they can to stop our campaign before it gets started – including using fraudulent journalism and discredited sources to launch their biased attacks," the email argues. The email then asks supporters to donate money "to stand up against corporate media’s attempts to shut down our campaign." Last week, Gabbard appeared on MSNBC's "Morning Joe" where she argued that "[Syrian dictator Bashar al-] Assad is not the enemy of the United States" and dodged when asked how she would describe his relationship to the United States. She even refused to hold Assad responsible for using chemical weapons against his own people, despite the ample evidence. Instead, Gabbard said, "it's possible" that Assad used chemical weapons against his own citizens. During that appearance, Gabbard engaged in a testy exchange with NBC News correspondent Kasie Hunt about an NBC report alleging Russia is trying to help the congresswoman's campaign. Gabbard argued the report "has been debunked and disproven," prompting Hunt to say she would not question her colleagues' "due diligence because I do know what our standards are here." "Here is the "debunking" of the NBC News report from RT, the Russian state media. You tell me which you think is more credible," Hunt tweeted. 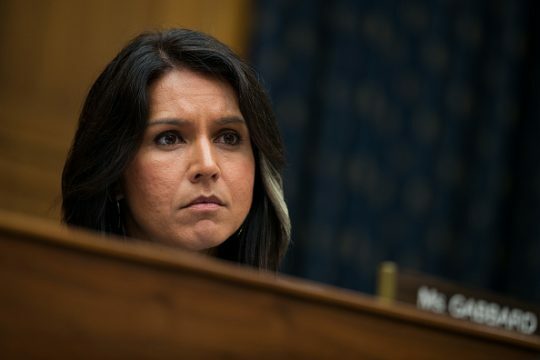 Gabbard continued to blast what she called NBC's "fraudulent ‘report.'" "MSNBC defended @nbcnews fraudulent "report" which was based on a "discredited cyber security firm recently kicked off Facebook for unethical MEDDLING of a state election." Shameful ‘journalism,'" Gabbard tweeted. The Intercept also published a criticism of NBC's report, saying it relies on a "firm just caught fabricating Russia data for the Democratic Party." Gabbard's campaign has struggled to find momentum. Within a week of announcing her candidacy, she had to apologize for past comments about LGBT individuals. At the end of January, Politico reported that Gabbard's campaign was in "disarray," with her campaign manager set to leave after her launch and people familiar with her bid describing her as "indecisive and impulsive." This entry was posted in Politics and tagged 2020 Election, Bashar al-Assad, Kasie Hunt, MSNBC, NBC News, Tulsi Gabbard. Bookmark the permalink.